When the team behind a revolutionary new sleeping product first approached Koobr in 2017, they came to us with a product prototype and an exciting vision for the future. 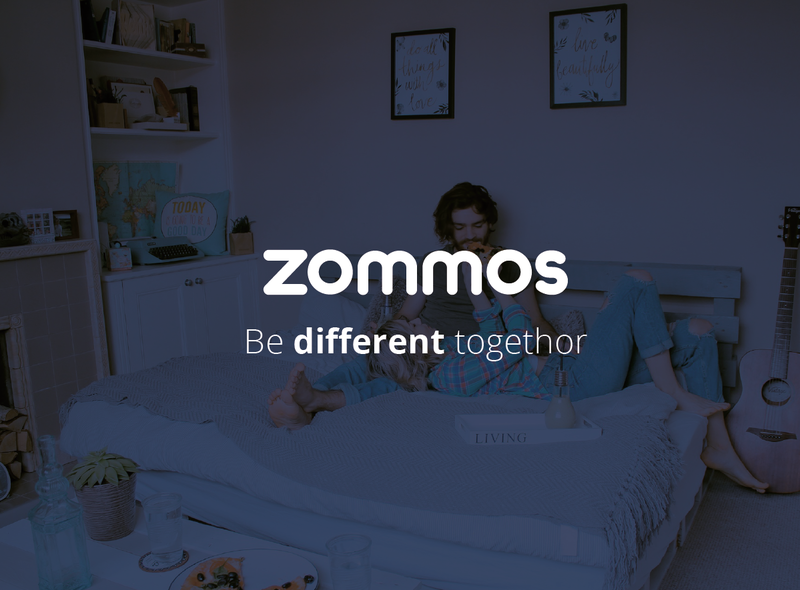 Today, Zommos is recognised as a leading brand in the bed retail space — securing supplier partnerships in the hospitality sector and is now featured in Next Home retail stores across the UK. Starting out with a completely blank canvas, the first thing to approach was the name of the product — and by extension, the brand as a whole. 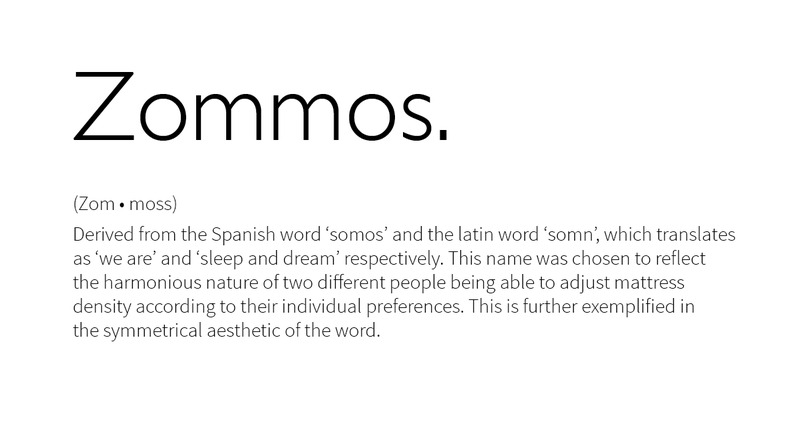 The product itself (a new kind of adjustable firmness mattress) was in the latter stages of development, so it was important to first establish the underpinning brand identity as this would inform the final product look. A deep-dive analysis of its features, USP’s and relevant markets was undertaken by our creative team; distilling the overarching philosophy behind the brand, workshopping a number of different concepts before a leading concept was chosen. 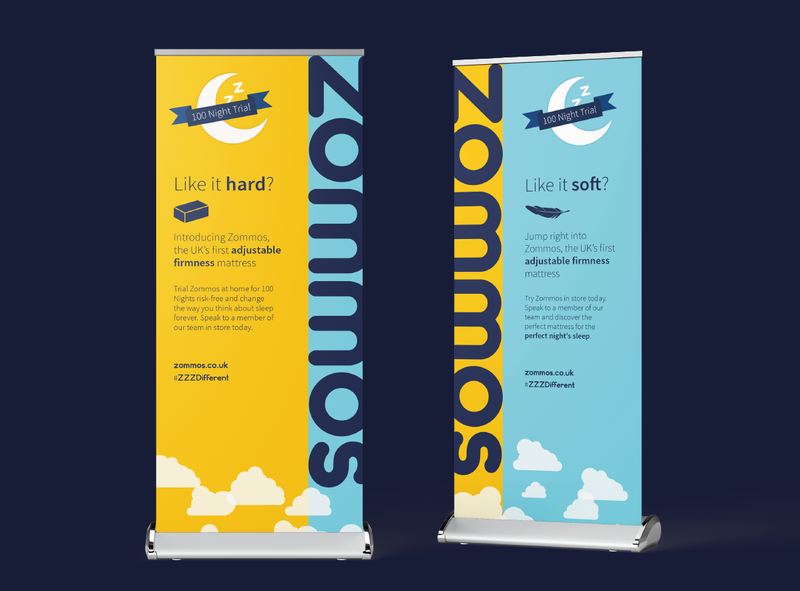 The overarching colour scheme was established through a combination of extensive market and competitor research; taking queues from proven visual styles in the market space, while at the same time introducing elements entirely unique and distinctive to this new product and brand. 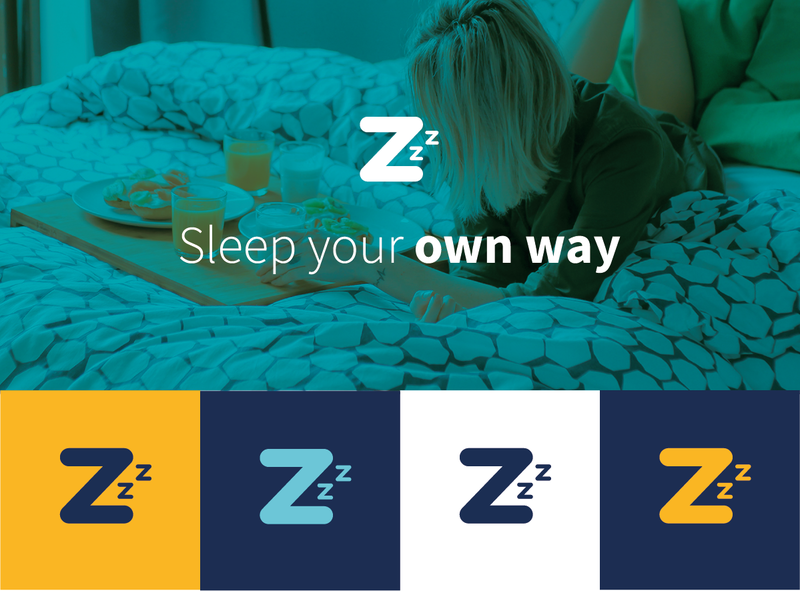 This was done in conjunction with the creation of a playful typographical logo that would be used as the lead identifier for the brand overall — present on the mattress tag, packaging, and other marketing materials. A single letter mark was also created to be used as a secondary identifier for the brand, as commonly used across digital platforms such as Twitter and mobile applications. With a strong visual identity firmly in place, supporting phrases and messaging was then crafted and expanded upon to breathe personality into the brand — resulting in a consistent, authentic and impactful tone of voice. This tone of voice featured prominently throughout the subsequent website, and was applied across key marketing materials, such as product packaging and point of sale displays for in-store use. With a heavy focus on targeting the online market, competing with mattresses from brands the likes of Eve, Casper and Leesa, a website with online shop functionality was required in order to serve as a primary marketing a brand communication tool. The initial stages of the website design (site structure, page layouts, and navigation) was planned prior to completion of the visual elements; mapping out a clear and concise user journey; highlighting relevant calls-to-action in the most appropriate places in order to help encourage conversions. Once these preliminaries were complete, visuals were laid over the top and any further refinements necessary were made to ensure the website was strong from both a brand communication and a user journey point of view. 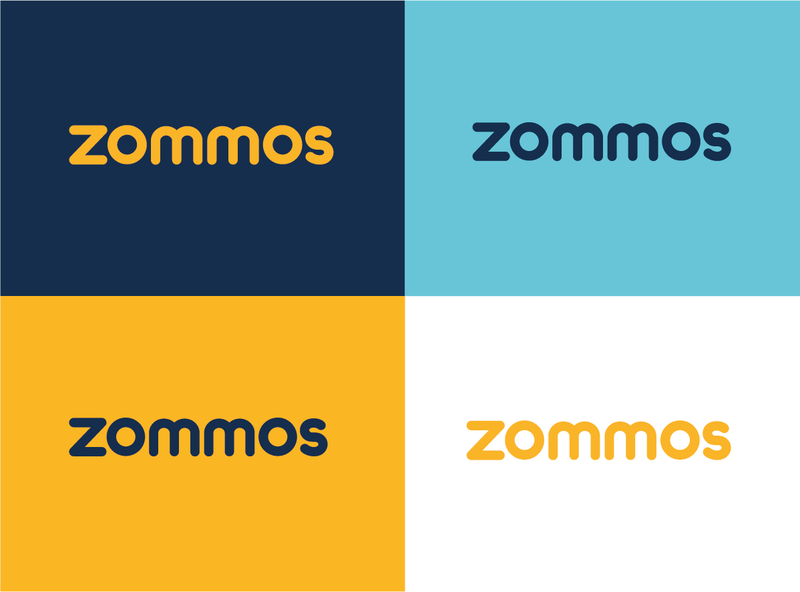 Taking a fully integrated approach, every element, branding, web and marketing, seamlessly comes together to help elevate Zommos as a product in the marketplace and successfully reach its audience. How the brand should look from a digital perspective was carefully considered from the early stages of brand development, and re-surfaced later on when icons were crafted for the new website; distilling the ‘buying’ and ‘100 nights trial’ customer process into salient points that made it quick and easy for users to understand. 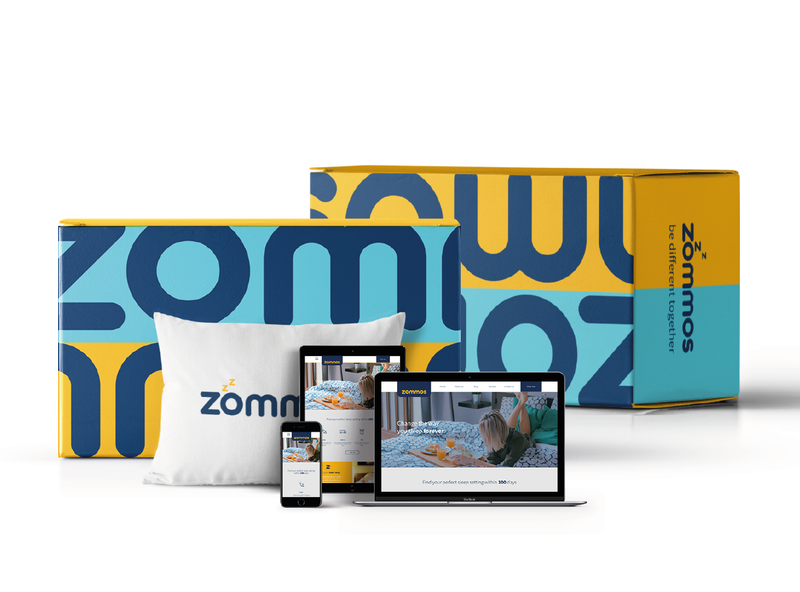 In addition to the e-commerce functionality, giving the Zommos sales team the ability to manage stock and administer promotions, a content management system was also integrated to allow its marketing team to manage content and marketing activities across the website. As part of delivering a positive user experience for visitors, inspiring trust, everything was designed with responsiveness in mind, ensuring seamless functionality and readability across all types of browsers, devices (desktop, mobile, tablet), and on all types of screen qualities and sizes. Got a creative project you want to get off the ground?